64 Recent Advances in Technology: Fish are Big Talkers! 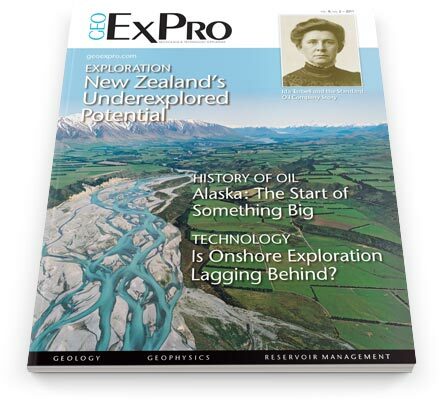 68 Are Onshore Exploration Technologies Lagging Behind? Of the 31,900 species of fish living today we know that more than 1,000 make sounds, ranging in frequency from 50 to 8,000 Hz. For most fishes, the sonic mechanism is a muscle that vibrates its swim bladder not unlike our vocal cord. For many other species, the sonic mechanism remains a mystery. New light has been shed on the petroleum potential of the Northern Arafura Shelf area in Eastern Indonesia. Are there continent-scale resources to be found offshore? Canada’s offshore oil and gas industry was born off the coasts of Newfoundland and Nova Scotia and is seeing promising signs of a rebirth. The mission of ‘Geoscientists Without Borders’ is to connect young geoscientists, academia and the industry with projects that will benefit people and the environment around the world. An oil discovery in the Moose Range wilderness on Alaska’s Kenai Peninsula would bring a momentous change to the territory and have oil exploration implications far to the north. With his training in electrical engineering as a foundation, Eldad Weiss, Chief Executive Officer of Paradigm, has taken a methodical, logical approach to growing his business from a niche provider of graphical imaging software to a global provider of exploration and production (E&P) data management solutions. RTM re-processing gives a new look at the Gulf of Mexico Continental Margin. Exploration opportunities in the prolific Bonaparte Basin of the Timor Sea. On a splendid white beach in Shark Bay, Western Australia, I finally found the worlds oldest fossils. They are commonly referred to as living rock, and they have ruled the earth for approximately 3.5 billion years, and continue to live today. No other form of life has survived so long. Exactly a hundred years ago Standard Oil, which controlled the oil industry in the US, was forced to split into several companies, due largely to the pioneering work done by Ida Tarbell. With the superb backdrop of the Rocky Mountains, the ‘mile high’ city of Denver has one of the most attractive locations of any oil town.